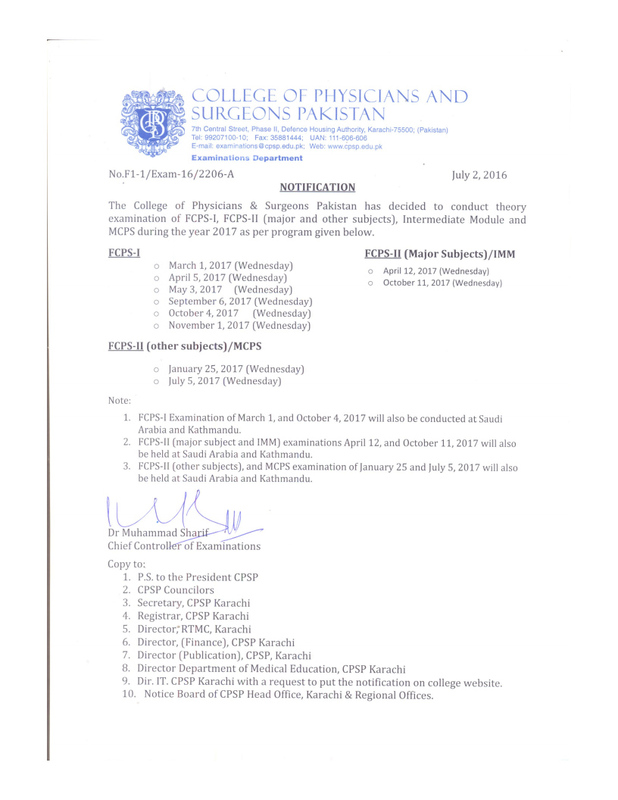 The College of Physicians & Surgeons Pakistan (CPSP) Karachi has decided to conduct written examinations of FCPS Part 1, FCPS Part 2 (major and other subjects), Intermediate Module and MCPS during the year 2017 as per programme given below. 1. FCPS-I Examination of March 1, and October 4, 2017 will also be conducted at Saudi Arabia and Kathmandu. 2. FCPS-II (major subject and IMM) examinations April 12 and October 11, 2017 will also be held at Saudi Arabia and Kathmandu. 3. FCPS-II (other subjects), and MCPS examination of January 25 and July 5, 2016 will also be held at Saudi Arabia and Kathmandu. You will get notified by CPSP as they might change the venue this time.